Real estate prices surged across the Yangtze River Delta in the weeks after the Spring Festival holidays in February. One factor responsible for driving up prices has been the explosive growth in down payment loans, which have been funded to a great extent through innovative financial products offered by peer-to-peer (P2P) lending platforms. Currently, there is a debate among experts about the risks posed by down payment loans. For their part, some local governments have strengthened home purchasing requirements to stave off wild fluctuations in property prices. Experts said these measures should keep a lid on risks to the domestic real estate market. In the weeks after the Spring Festival holidays in February, real estate prices surged in the Yangtze River Delta, especially in Shanghai. The price of new commercial housing in Shanghai rose 2.9 percent from January to February, the second largest increase in the country, according to a statement released by the National Bureau of Statistics on March 18. Prices rose 2.7 percent month-on-month in February in Nanjing, capital of East China's Jiangsu Province, which came in third. Shanghai is about 300 kilometers away from Nanjing. Home prices jumped the highest in Shenzhen, South China's Guangdong Province, where the price of new commercial housing rose 3.6 percent over the period, the statement said. "Since the second half of 2015, residential housing prices in Shanghai have continued to rise," said one former owner of a real estate agency, who preferred to be anonymous. 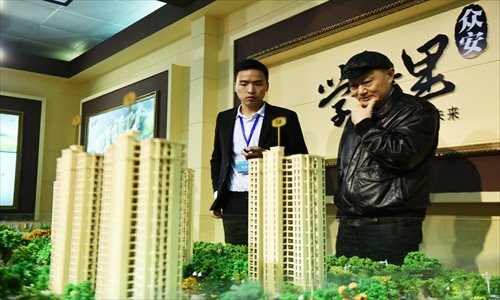 "It's very common for secondhand home sellers to raise prices, even though they've agreed to sell their homes, particularly in the weeks after the Spring Festival holidays," he told the Global Times on Thursday. For example, in Shanghai, one seller might raise his price by 500,000 yuan ($77,349) after agreeing to a price of 5 million yuan, the former agency owner said, noting that the house would still receive plenty of offers at the higher price. Another factor for driving up prices is the down payment loans that many large real estate agencies have been offering to buyers, he noted. The loans are considered a form of financial innovation. However, some experts have raised concerns that the leverage posed by such financial innovations was one of the reasons for the recent rise in residential property prices, particularly in the Yangtze River Delta areas. It has become more difficult for home buyers to borrow money from banks because the banks need to control their risks, Xue Jianxiong, president of Youtaocheng Co, a Shanghai-based real estate agency, told the Global Times on Thursday. The strict lending rules have given rise to peer-to-peer (P2P) lending in China. At least 50 P2P lenders in China have provided funding for down payment loans, according to a report in March by Shanghai-based consultancy Yingcan. P2P lenders raise money from investors, and then lend it out at higher interest rates to borrowers. From July 2015 to mid-March 2016, P2P lenders lent out more than 4 billion yuan in down payment loans, according to the Yingcan report. About 20 P2P lenders, including Sohu's subsidiary souyidai.com, focus on the business of down payment loans, though they recently have had to suspend offering the loans, the report said. P2P lenders lent 924 million yuan in down payment loans in January alone, triple the amount they made in July 2015, according to a report by The Wall Street Journal on April 4, citing data from Yingcan. Along with providing the down payment loans, many new financial institutions are eager to introduce property-related financial products due to the growing market, Xue said, noting that the products pose a huge risk to financial institutions if housing prices decline dramatically. The products could create some additional risk to the real estate market in the Yangtze River Delta, said Shaun Brodie, head of China strategy research at DTZ/Cushman & Wakefield. "There might be cases where some buyers might overstretch themselves financially by taking on such products," Brodie told the Global Times on Thursday in an e-mail. There are actually a number of reasons why prices have risen steeply recently in first-tier cities such as Shanghai, Brodie said. Those reasons include stable demand, low inventories, greater liquidity, lower interest rates, and investors moving money from the stock market to the real estate sector in first-tier cities like Shanghai. There is also an element of "group think" on the part of buyers who worry that they need to get in on the market now because prices are about to rise, Brodie said. Innovative financial products have definitely played a part in the recent price rise, "but when the overall picture is viewed, their contribution to rising prices has been smaller than the whole of the rest of the contributing factors," Brodie noted. Some city governments have recently implemented policies to keep home prices under control. On March 25, the Shanghai municipal government introduced new requirements on home purchasing, such as raising the minimum down payment for second-home buyers from 40 percent to 50 percent. Under the new rules, residents without Shanghai hukou also have a harder time buying property in the city. Shenzhen announced similar measures later on the same day. In Suzhou, East China's Jiangsu Province, the government banned homebuyers earlier this month from tapping credit cards for their down payments, according to a report of Suzhou Daily on April 2. "It's good for the local governments to implement policies to control housing prices in order to prevent a dramatic rise or fall in prices," Xue said. "Currently, the authorities can't fully prevent the risks that might be brought on by property-related financial products," he noted. "Increasing the down payment requirements is an effective way to prevent the potential risks." It would also help if authorities strengthened supervision over new financial products, Xue said. At a press briefing on March 12 on the sidelines of the annual National People's Congress, People's Bank of China Governor Zhou Xiaochuan said home buyers are not allowed to borrow money for home mortgage down payments, according to a report on the domestic news portal sina.com in March. However, financial risks due to over-leveraged buyers in second- and third-tier cities in China are unlikely to occur because buyers in these cities don't need to borrow as much to make their down payments, Brodie said. Meanwhile, prices in second- and third-tier cities have not risen as fast as in the first-tier cities, so home buyers don't feel such as an urgent need to buy property, he said.